Taken in Utsunomiya on Showa 19, March 22 (March 22, 1944). 65 years ago. This is a Monochrome Monday entry. That is definitely a moving image. So young. I'm assuming that that is his mother. Very evocative image from a long ago time of turmoil. Hi Carolyn, yes it is, isn't it? Grandma is very attached to her war album and it took us a lot of convincing that we should scan the whole thing for posterity. I'm thinking to post other photos from her collection from time to time. John, I agree, and there is still so much left to scan at her house. He looks far too young for this. I love to see history in pictures. Glad I came back to see your replies. 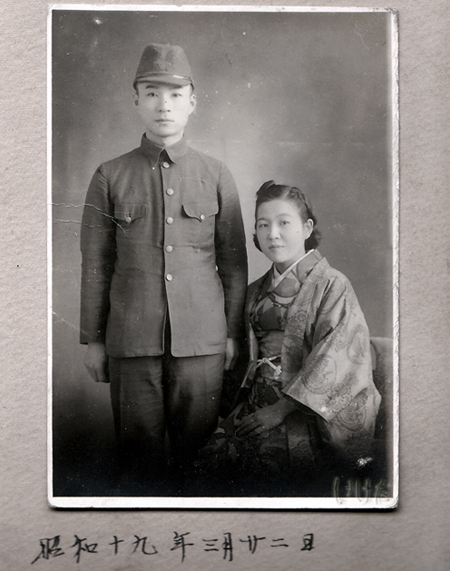 Learned much about the Japanese people and the war effort of that time when I read Haruko Taya Cook and Theodore F. Cook's Japan at War: An Oral History, within the past twelve months.